With global oil supply on a rough plateau, and developing oil countries' usage increasing, oil usage in developed countries must decline. This has to be accomplished through some combination of using oil more efficiently and just doing less. 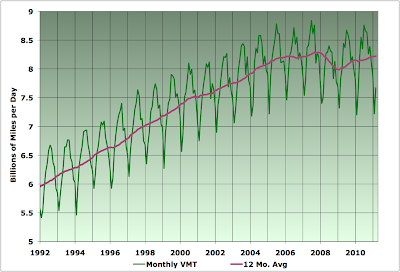 The above are the data for US vehicle miles traveled, and indicate that US VMT has not regained the peak of 2007. With gasoline still above $4/gallon, I doubt that this series will be increasing sharply in the near future. Interesting, VMT regained levels near the '07 peak in '08 and '09, with a reduction of (eyeballing it) only around 1%, yet US oil consumption fell by nearly 10% from 21 to 19 mbpd (rough numbers). This suggests that long-distance commuters are switching to smaller vehicles (rather than using public transportation) even if the vehicle fleet mileage as whole remains around 25 mpg. It's interesting that an inflection point appears to occur around 2005, well before the economic downturn, but about at the point that the price of gasoline reached $2.50 per gallon. There have been only two other periods since the 1920s when the inflation-adjusted price of gasoline has been higher than $2.50/gal., these were WW II and the late 70s thru early 80s. I couldn't find any contact details on your site and was hoping to talk to you about working together. I run the website www.oilprice.com and wanted to discuss certain synergies between our two sites. James - my email address can be found in the "About Me" section on the right hand side of the blog. The cessation of growth in VMT that took place about 2005 looks historically significant. 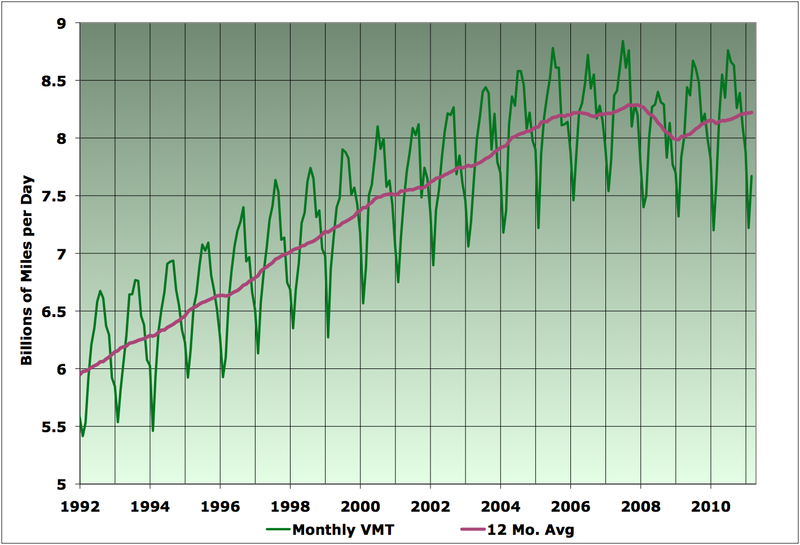 I graphed yearly VMT from 1936 to 2010. (posted at http://michaelaucott.blogspot.com) The only other time VMT was declining or flat for over five years was WW II, when gasoline was rationed.